It’s the usual hectic evening for the Landlord and Landlady as they tend to customers in their busy pub. They present a chirpy, united front for the punters, but the cracks of their strained relationship, caused by a painful, unhealed wound from the past, are about to tear open. As their problems become apparent, we are introduced to the ‘regulars’ of the pub – a host of eccentric characters, each with their own stories. Amongst the barflies and wallflowers are an ageing womaniser, a troubled old man, and Alice, who’s “never been the same since Elvis died. 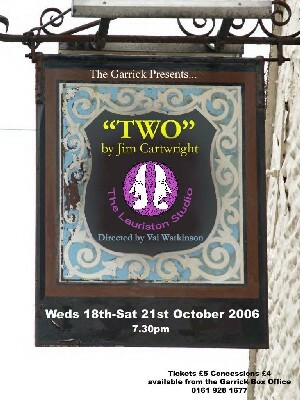 Just two actors take on all fourteen roles between them in Jim Cartwright’s beautifully crafted, gentle comedy-drama. (Only two actors need to be onstage at any one time) Two takes you on a journey through the pains, pleasures and passions of a Northern pub life: often touching, occasionally harrowing, but essentially life-affirming. The play that had the honour of launching The Lauriston Studio in October 2006 was the hugely successful ?Two? by Jim Cartwright. This play was a great example of a show perfectly suited to the theatre?s intimate setting and for those who saw it, I don?t think I?m alone in saying what a truly memorable and moving ?event? it was. Directed beautifully and imaginatively by Val Watkinson and featuring Caroline Hickey and Dave Midgley playing fourteen different roles (! ), we were transported to a Northern pub for a touching, heart-breaking and ultimately life-affirming experience. With remarkably versatile performances from Caroline and Dave, it was a critical and artistic success and a fantastic debut for Altrincham?s newest theatre!